Grayson usually wakes up between 3:30 and 4:00 AM to eat and then goes back down for another hour or two before getting up for the day. So last night before Ryan and I went to bed, I mentioned we didn’t need to set the alarm for the Royal Wedding because we had the perfect alarm clock right next door. Obviously, we are not die-hard Royal fans by imploying this wakeup method. Well, G-Man obviously wasn’t too concerned about the events leading up to the actual nuptials because he didn’t start waking up until 5:30, right when Kate was making her way down the aisle. Perfect! So Little Man and I got caught up in the wedding excitement and watched ad nauseum, all morning long, until it was time to head to the pediatrician’s office for his weight check. I felt like I was heading to a parent-teacher conference…what grade was my child going to receive? Had our work from the past month feeding him extra calorie formula done any good? I’ll admit something- to get in some 11th hour weight gain I attempted to give him an 8 oz bottle about an hour before we needed to leave. He’s never taken more than 6 ounces at a time. He promptly drank 2 ounces, emphatically refused any more, then 5 minutes later dramatically projectile vomited the 2 ounces all over himself and me. And I had him in a really cute outfit. I’ll show you, Mom. As of 10:30 this morning, Grayson weighs 14 pounds, 8 ounces. We are back up to the 1.5 percentile. So now only 98.5% of children his age weigh more than him. My little Heavyweight Champ was a pill while the nurse weighed him and checked his heart and oxygen (do you think his 2 specialist appointments, EEG and 2 blood draws the past few weeks have given him a complex?) but thankfully fell asleep so I could talk to the doctor without a screaming-soundtrack. We discussed his possible reflux (he gags, coughs and spits up a lot) so we are going to try Prevacid for a month to see if that makes a difference. I told her about his struggles with solids, which probably are just another developmental delay but if it doesn’t improve in a few months she might refer us to an ENT. We talked about his visits to the neurologist and the endocrinologist and I realized I now sound like I am reading a book when I talk about this stuff. She does not agree with the diagnosis of Septo Optic Dysplasia, because of the lack of evidence of a metabolic disorder. In fact, she had already been sent some of the results of the blood test from Monday! All of the blood and urine came back normal- no metabolic issues. We are still waiting on the chromosomal tests- I’m sure that will take awhile. So we’ll keep plugging along- it’s a marathon, not a sprint, right? Our next goal- independent sitting. G’s probably still a few months from reaching that goal, but we are working hard. 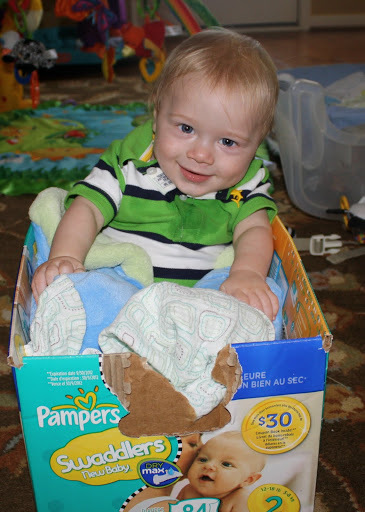 Our newest therapy tool- a diaper box. Gotta love free equipment! Can I Clock Out Every Once in Awhile? Love the pic, so cute! Great idea for something to sit in to help him get stronger. Glad the appointment went well and hopefully the meds will help the spitting up. Whoo hoo for the weight gain! my little alarm had me up at 4:30 AM so it was perfect!! i totally stayed up and watched it and he slept until 6:36 (mid ceremony darn it) and fell back asleep by 6:49 (yay) just in time for me to catch the recessional. i know exactly how that screaming soundtrack goes at the doctor. we didnt even have shots last time and blaine was hysterical!hilarious that he puked up that last minute feeding!! LOL.